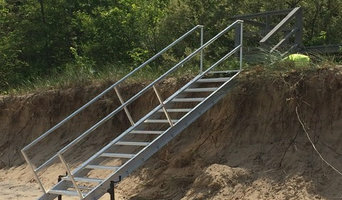 Farren's Metal Works & Aluminum Stair Systems designs and fabricates custom permanent and removable stairs for homeowners and businesses along the lakeshore. We specialize in our Aluminum Stairs which are rust-free, adjustable and meet ADA and OSHA requirements. We also custom fabricate deck railings. Michigan Stairway and Custom Woodwork is a high end Woodwork company specializing in stairways. We have a 3000 sq ft shop we specialize in the unique pieces a customer might need.